My dining companion this week is Martijn Gilbert, the outgoing (in every sense) CEO of Reading Buses. I realised Martijn wasn’t going to be your usual dining companion relatively early on in our meal at Afghan, just after we took our seats in one of the booths at the back of the room and began looking at our menus. I was looking at the menu, anyway: Martijn, on the other hand, was peering intently through the big windows out on to the Wokingham Road. “What do you mean?” I said, assuming he was talking about the presence of houmous on the menu of an Afghani restaurant. Martijn gave me a kindly, indulgent look, as if he’d just heard something crashingly stupid but was far too nice to correct it, and said something about low bridges. It all sounded very convincing, although my mind was also whirring with other thoughts, mainly about how many main courses we could snaffle between the two of us. After all, Martijn had specifically told me he only had a salad for lunch to ensure he was in peak dining condition. So he did, and it turned out it was a known diversion and not some bus driver having a funny five minutes or, worse still, about to recreate Speed just outside the Early Café. But even that incident gave me an idea about what Martijn was like in work mode, and it was impressive stuff: the sort of perfectionism I also see in some restaurant owners, where they know everything about everything when it comes to their business. I aspire to that, which is why I re-read my reviews countless times before they are published on the blog – scanning for typos and needless commas, mostly – but I’m small time compared to this. The irony about Martijn’s intervention was that I’d deliberately chosen Afghan to review with him because it was on the 17 bus route; just like the tote bag they sell in But Is It Art? says, the number 17 route is the backbone of Reading. Sometimes it seems like all human life joins and leaves that great thoroughfare at some point – whether it’s the leafy gentility of the Earley borders, the icon that is Cemetery Junction or the fleshpots of the Oxford Road. I used to commute to work on the 17, many moons ago at the dog end of the 90s, from a shared house on Talfourd Avenue where I was the only person not doing drugs, and I’ve always had a big soft spot for it; to me, as much as the River Thames, it defines the town. It pleased me, too, that Martijn caught the number 17 to the restaurant – as did I. Martijn told me previously, during a boozy night in the Retreat, that if the number 17 route hadn’t already existed, nobody would have invented it: it simply made no sense to join up the far East and West of Reading in this way, and in any other town it would have been two separate routes. But Reading had it, and it worked, and people seemed to like it, so nobody has ever messed with it. “Our data shows us it isn’t always heavily used during the day” said Martijn, “but we’re not changing the timetable. It goes every seven minutes, without fail. That’s the 17 for you”. I loved that, another of many things to love about Reading. Of course, I don’t just pick restaurants because of their public transport links and Afghan had come highly recommended by a number of people in the run up to my visit. One friend told me they had a real talent for cooking lamb, another friend enthused about her trip there a couple of days before my visit. 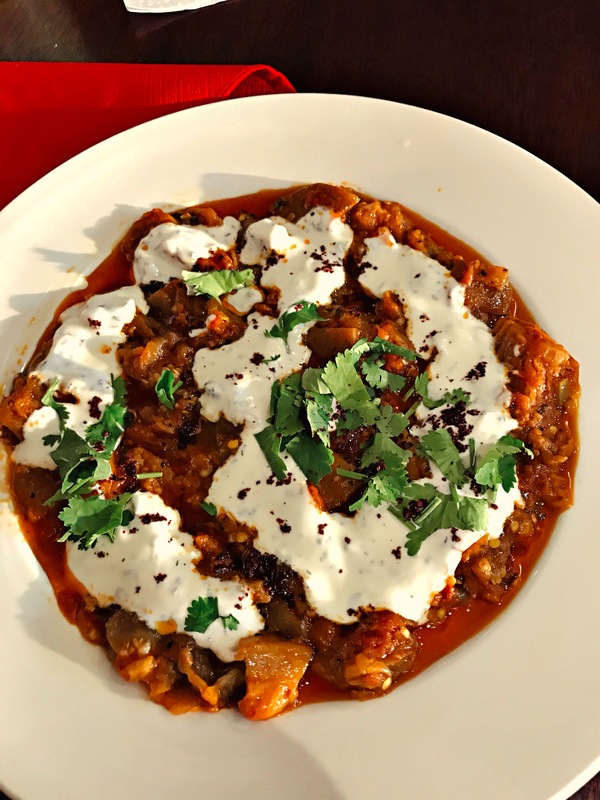 My regular reader Mansoor – an expert in these things – recommended one dish in particular, telling me his wife had ordered it three times in two weeks. All that and independent and in an area somewhat lacking in decent restaurants: how could I not give it a whirl? The room was pretty much unchanged from its previous incarnation as Lazeez – a big square, booths and banquettes around the edge and tables in the middle (I know that, because I looked up the old review for Lazeez and was struck by how much of it I could have just copied and pasted). Martijn and I were at one of the booths, which could have generously seated four but turned out to be just right for the quantity of food we ordered. The menu reminded me very much of the menu at Kobeda Palace, the Afghan restaurant at the other end of the 17 route, only a little wider and far more polished-looking: at Kobeda Palace you could be forgiven for thinking you were in a kebab house, with the preparation and cooking front and centre, whereas Afghan was more obviously a restaurant. Some dishes were more expensive, but many weren’t. I managed to persuade Martijn to order a starter and three mains to share, and as nobody at Afghan tried to deter us I assumed that our order was deemed plucky rather than foolhardy. The first thing to arrive was a dish I’d been very excited about trying, the chapal kebab. This was the dish Mansoor’s wife had so admired, and it’s been described as the best thing to come out of the Khyber. As a die hard Carry On fan I found this difficult to believe, so I was determined to see what the fuss was all about. 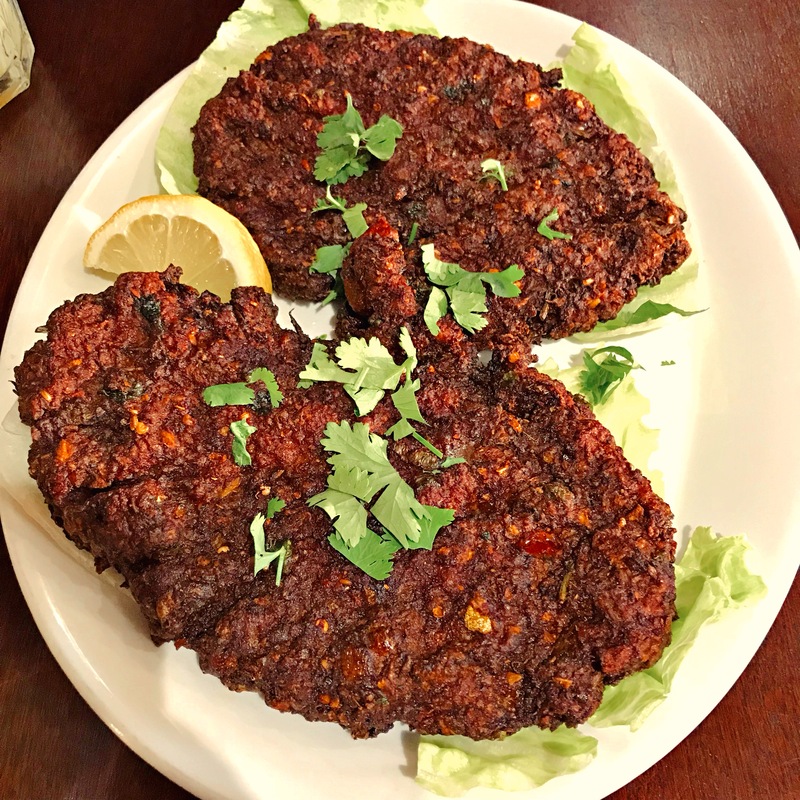 A chapal kebab is quite hard to describe, but here goes: it’s sort of like a spiced lamb kofte but instead of being in your traditional cylindrical shape it comes as a flat patty more like a burger, cooked in fat and packed with onion and green chillies. When it arrived I thought it looked rather like a pair of smokers’ lungs, but from the very first mouthful I knew this was a dish to be reckoned with. How did they get the contrast between the almost crunchy outside and the juicy inside so bang on? It went beautifully with all three dips at the table – a green one full of coriander, a red number which looked like it would be diabolically hot but was more like a sweet chilli sauce, and a cooling yoghurt with mint. “This is good” said Martijn, wasting no time setting out demolishing one of the kebabs, and I couldn’t disagree. The naan it was supposed to come with didn’t arrive until later, one of many oddities about the timing which slightly marred matters. Instead, we got the only conventional starter we’d ordered: bourani banjan, aubergine with tomato and yoghurt. Aubergine isn’t everybody’s cup of tea – often it isn’t mine – but this was a properly lovely dish and astonishingly good value at three pounds. The aubergine was sweet, sticky and beautifully cooked with none of that spongey boredom it all too often presents. In an ideal world we’d have been left to finish that little lot before more food turned up, but that was not to be. Instead, a groaning dish of lamb biryani was brought over when we were barely halfway through. 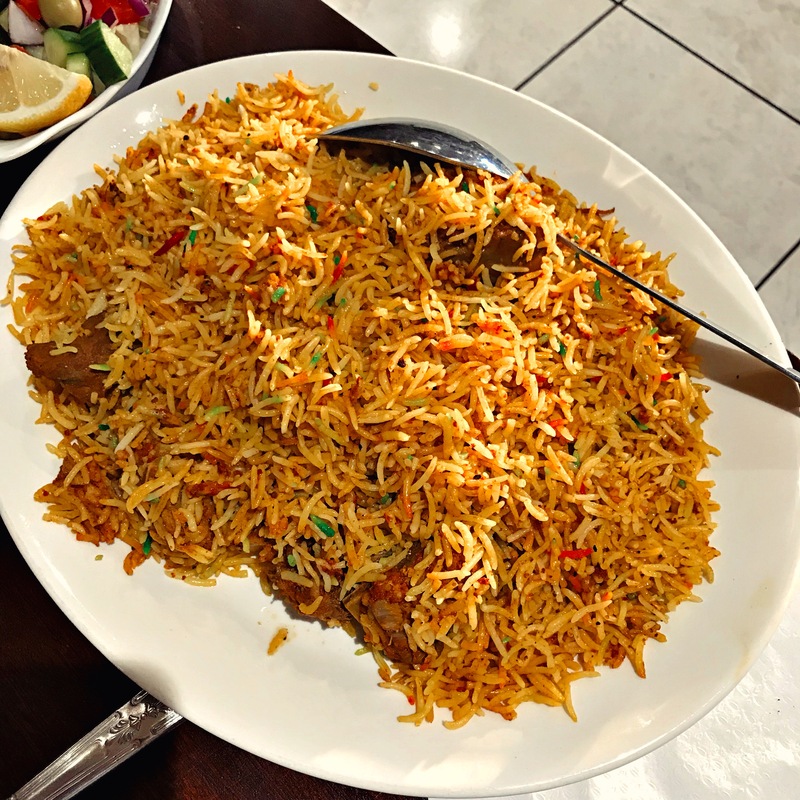 How much you’ll like Afghan’s biryani, to some extent, will depend on how you feel about meat on the bone – most of it slid off, but there was a bit of a variation in texture. I didn’t mind it, and I know that lamb on the bone is far more authentic for these things, but it wouldn’t be for everyone. The rice was well spiced (if not the best example I’ve tasted) but there was a lot of it, so the ratios felt a little off. On the other hand, this dish was nine pounds, so that feels like a quibble. At the risk of inducing déjà vu, in an ideal world we’d have been left to finish that (not especially) little lot before more food turned up, but that too wasn’t to be. So we were partway through pretty much everything we’d ordered when a big dish of charsi lamb karahi was deposited at the table, along with our naan bread which, by that point, I’d pretty much forgotten about. The lamb karahi is ordered in multiples of half a kilo, so we’d ordered the entry level five hundred grams. When it arrived, I told myself it was okay because much of it would be bone: and, again, how you feel about this dish will partly depend on where you stand on meat on the bone. I found this a little trickier and less enjoyable – the sauce was deep, thick and peppery but lacked some of the spice and fragrance of, say, Kobeda Palace’s quite extraordinary karahi. We had an ordinary-sized naan bread (which was meant to arrive at the same time as the chapal kebab) but we’d also ordered an “Afghan naan”, because I’d been told these were quite the talking point. And it really was – a huge thing which turned up vertically, impaled on some metal stand and brought to the table. It was so big it blotted out some of the remaining daylight outside, so big in fact that Martijn took a selfie with it for sheer novelty value. But the novelty value was the main value, I think. Getting it off its makeshift gallows was a faff, and it was a little rigid and crispy rather than soft and yielding – you could load stuff onto it, but it was much more difficult to use it for scooping. That said, the karahi was a relatively dry curry, so perhaps scooping was a bit hopeful anyway. “It’s great that Reading has independent restaurants like this and not just lots of chains” said Martijn, grabbing another mouthful of the karahi and I sensed, not for the first time that evening, perhaps a little bit of regret at leaving his adopted town. I could see why – I mean, he might be able to actually buy a house in the North East but would he ever find an equivalent of the Maiwand Lion, or Smelly Alley, or the Nag’s Head? Like quite a few of Reading’s more interesting restaurants Afghan is unlicensed, so Martijn had something fizzy and I ordered my beloved mango lassi. It was three pounds for a glass or six pounds for a jug, so I got a jug and Martijn helped me out with it, although we left a little. It never disappoints, but it did have the slightly gloopy and sweet taste of stuff that might not have been freshly made. Dinner for two came to fifty-two pounds, not including tip, which really isn’t half bad when you consider that what we ordered probably would have easily fed three less gluttonous people. I haven’t mentioned the service, but that’s because it was pretty unobtrusive: pleasant enough, just attentive enough but nothing to write home about. The restaurant wasn’t busy on the night we went, but there were a few families and bigger groups. As so often, I was struck between the contrast of the quieter, more polished interior of Afghan and the scruffy, more boisterous Kobeda Palace. Your mileage may well vary, but I think I prefer the latter. That comparison has weighed on my mind a lot since my visit because if you’re comparing like for like, for me at least, I think Kobeda Palace would win every time. With the exception of the chapal kebab – a delicious, intriguing dish I could gladly revisit – I thought Kobeda Palace won on points at every level. I preferred the ambience, I preferred the karahi, I preferred the naan. In fairness, Martijn was a big fan of Afghan, but I did wonder if that was because he just hadn’t been to Kobeda Palace. Perhaps just using that comparison isn’t fair, because Afghan is also in competition with Miah’s Garden Of Gulab a few doors down, or Vel, or any of Reading’s countless Indian restaurants. And on that level perhaps it fares a little better – the food I had was good, and interesting, and I saw enough on the menu to want to go back, to try the samosas, or something else from the grill. And, of course, you also have to bear in mind that East Reading has a dearth of good restaurants: Garden Of Gulab is no great shakes, the Hope & Bear is another Mitchell & Butler pub, “Smokey’s House” looks best avoided and I Love Paella has, perhaps sensibly, left the Fisherman’s Cottage. In the kingdom of the blind, the one-eyed man is king and Afghan is very far from one-eyed. Maybe it has a bit of a squint, but it’s still possibly the best option in that neck of the woods. After the meal Martijn and I wandered to the Hope & Bear for a gossip and a debrief, which gave me the opportunity to confirm my suspicions that the facelift it received when it rebranded from the Abbot Cook largely consisted of painting the whole thing green and putting new furniture in the garden. On our walk there, Martijn spotted a bus stop which wasn’t to his satisfaction, and took a photo. “Do you think your staff will miss you randomly sending them photos of bus stops on your travels?” I said. He smiled. The employees of Reading Buses might not miss it, but actually I will, and I suspect Reading might too: it’s nice to have somebody in charge who cares. We sat in the garden, pretending it was warm enough for a couple of pints, and discussed Martijn’s plans to get through all ten of the dishes on my list of Reading’s most iconic meals. I don’t think anything from Afghan will make the second edition, although the chapal kebab might scrape an honorary mention. At the end of our evening we took the 17 together from outside the pub. “And the newer timetables will look much cleaner, too.” I said, finally feeling like I was getting the hang of it. Martijn’s enthusiastic reaction suggested that maybe I was. The bus pulled up and the driver let us both on, and if he was anxious about the prospect of driving the head honcho into town he kept a magnificent poker face. “I like to think they see me as one of the gang” Martijn told me, as we sat at the back and watched the Kings Road hurtle past, riding Reading’s greatest thoroughfare again. How many times have I taken this bus in my life? I wondered. It felt like the 17 had always been there, and I found myself hoping it always would be. And best of all, I got to travel back to the Village for nothing because I was taking the bus with the boss. I reflected later that it might be the only freebie I’ve ever received on duty: a freebie of which I’m strangely proud.